Joined Lowetide on Monday morning on TSN 1260 to talk Oilers. Clip is below and starts around the 25 minute mark. 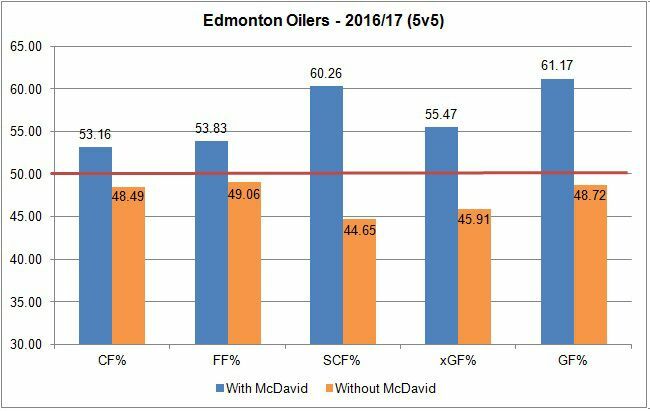 One of the more interesting issues around the Edmonton Oilers this season has been the performance of the team when Connor McDavid hasn’t been on the ice. The second-year forward has been an absolute offensive force for the club, consistently using his skill and speed to lead the attack and create scoring opportunities at will. Over the course of the season, the Oilers as a team have maintained a decent share, right around league average, of the shot attempts, scoring chances and goals, thanks in large part to the play of McDavid. What we’ve come to realize though after 71 games is that the Oilers are icing two very different teams: one with McDavid that can outshoot and outscore opponents, and another one without McDavid on the ice that posts numbers below league average. With McDavid on the ice at even-strength (5v5) this season, the Oilers have an incredible goal-share of 61.17% (outscoring opponents 63 to 40). Without McDavid on the ice, the team can only muster a goal-share of 48.72%, having been out-scored 80-76. When it comes to shot-metrics, which are used to predict future goal-share, the Oilers have a Corsi For% of 53.16% with McDavid on the ice, having outshot opponents 1,151 to 1,014. Without McDavid, the team has a Corsi For% of 48.49%, below league average and a troubling number considering the expensive personnel on the roster. Please refer to the Appendix for descriptions of the five metrics. Now the good news is that the secondary lines have recently been contributing more. Jordan Eberle appears to have bounced back from his poor start and has been productive on a line with Ryan Nugent-Hopkins and Milan Lucic. The trio have played 220 minutes together so far, and hold a Corsi For% of 51.39%, scoring five even-strength goals together and allowing six. The newly formed trio of Montreal castaways featuring Benoit Pouliot, David Desharnais and Zack Kassian have now played roughly 48 minutes together, outscoring opponents 4-2 (a goal-share of 66.7%), and getting 48.8% of the shot attempts. Worth noting that this line is riding a 17.4% shooting percentage, which is likely to drop off eventually. While the goal-scoring has improved without McDavid on the ice, a closer look at the shot metrics indicates that the secondary offence is still sputtering. 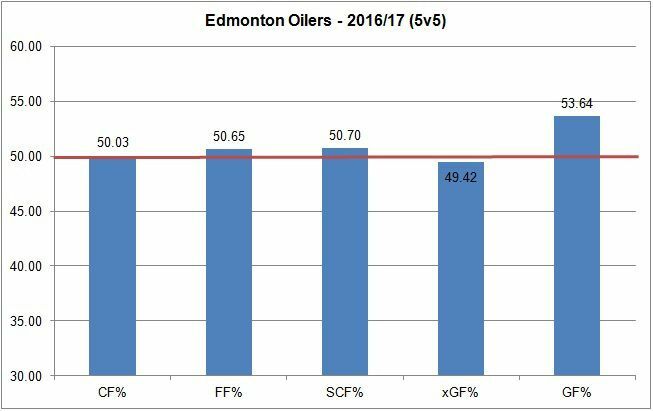 Below is a graph with the five metrics broken out into rolling 25-game segments, capturing the team’s performance without McDavid.